Well, that's certainly true when we think about the people who come into our lives. What we see isn't always what we get, right? The same is true with books. Yet don't we reach for the fancy packaging, the one with all the splashy colors and pretty pictures on the front? Or the one with an image that resonates with us? Even when we know it's what's inside that counts the most. That cover is the first impression and it means a lot. So when we authors see our cover art for the first time, it can be a mixed bag. Sometimes objects appear on the front that aren't even in the book. Sometimes the artist misses the essence of the theme and setting by a long "shot". Sometimes we love, love, love what they did. Most of the time, we aren't involved in the cover design decisions at all. One day, out of the blue, an attachment arrives in our inbox from the publisher. And there it is, in all its glory. Or not. I've been lucky with my more recent stuff. My publisher gives me a little voice before the staff meets to work up ideas. Berkley Prime Crime (where my doll series was published and where the Queen Bee mysteries under my pen name Hannah Reed will be published) has a great track record for doing things right (usually). Recently, a bunch of us got together to bemoan some of the worst mistakes made in cover design. We all write cozy mysteries (yea, for cozies! ), which means absolutely no blood and guts hanging out. Nothing "grizzly", so to speak. Which one would you buy? p.s. 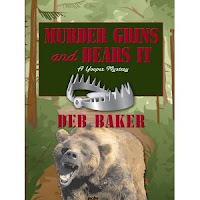 there are NO traps, snarling bears, or killed animals in the book. And authors, feel free to join in with your own stories. This is a hard one. I guess #1 looks more like what a cozy book cover should look like. What I don't like about some covers is when there are things that do not appear in the book. Like this one, no bears or traps. I think it is a slap in the face to the author, like the publisher doesn't really care what the book is about. They just want a catchy or attractive cover that will sell the book. If you ask me, I would not buy either book. A book like Delicious and Suspicious I would pick up for the cover alone (well, not really, but you know what you mean), but when I see either of these covers, I will pass by. Of the two the first is slightly better, but neither is appealing. Poor you to be stuck with them. To me cover number one does look like a cozy mystery while cover number two looks like it would fall into just the murder mystery category. As much time and trouble an author puts into their work, it looks like the graphics department would at least ask for suggestions of what should be on the cover. Well...first off, neither look cozy and when I got to buy a cozy book, I do look at the cover. I look to see if it's a bookstore scene if it's a bookstore cozy b/c I want that image in my head to start off with. I wouldn't pick up either book, but if I had to choose, book #1 comes closest to a cozy-looking cover. Annette, actually a bear does make a cameo appearance in the book. Rayna, Delicious and Suspicious has a great cover (and a very talented author). I agree with everyone else - I am not a fan of either cover, but cover #2 makes me think of some wilderness survival book - which is NOT the kind of book I pick up. I'm afraid I have to agree on this one. Neither cover appeals to me but the second is a total turn off. The title might cause me to look past the graphics, but unless I was specifically looking for a "Deb Baker", probably not. The weird thing is that the title and the cover are totally opposite in both cases. What was this artist thinking? Neither of these books appeal tome at all. Both covers turn me off, and away. Along with everyone else I have to agree I don't care for either cover, book 1 I would be more inclined to by as it is more on the cozy side. Book 2 makes me think someone is going on a camping trip or like Andrea said a survival guide. I'm not a fan of either cover, but like most, if I had to choose I'd pick the first one. I sometimes wonder if the cover artist actually bother to read the book before creating the cover. I think it should be a requirement. I'm an elementary school librarian so I do know that at least when dealing with children, the covers are very important. I once worked in a library that had a number of books that had been rebound with plain no picture covers. It was hard to get a child to check out those books even if they knew the story and were interested in it. Let's face it, we are a visual society. Looks are often more important than they should be. On the other hand, if it's an author I know and love and trust, I'll read the book regardless of the cover. Book cover #1 would be my pick, if I were to select one. I agree with the others, they are not really cozy covers. #2 -- OUCH! Cover #1, lesser of two evils. Like someone else said, why doesn't the artist assigned to the project at least briefly scan the material, and have a chat with the author? I think that should be a requirement of the job. I know they are busy, too, but still. This same kind of thing happens with movies based on books. Why put things in the movie that weren't even in the book, weren't even remotely referred to? One that comes to mind for me is "Scarlett"; loved the book, absolutely hated the movie. Good luck with whatever project you have coming up next. And like you said, Berkeley Prime Crime does do a pretty good job. Thanks for all your comments. We need to get together and brainstorm next time I have an opportunity to make a decision on cover content! I don't care for either one, but number 2 would get my attention. Agree however,it looks more lke a survival book,than a cozy. But I am known to read those from time to time as well. I don't like horror stories, and the trap on cover 2 is horrible, and that is the most prominent--it would be all I see in a book store, so I would bypass it. What are the publishers thinking? They want your books to sell. Good grief, folks, work with your writers! Deb...you answered a question that I think of all the time..."who does the cover art and is the author involved?" WOW...that 2nd cover is frightening. Out of curiosity I asked my my 16 yr. old son which one he would pick up and the 2nd cover won hands down!! Which say a whole lot, doesn't it? I became a cozy fan about a year ago after some surgery. A sweet friend sent me a few and BAM! a new fan was born. I love your UP series being that I am a lifelong "troll"! 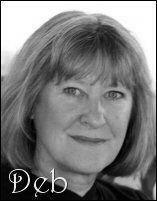 Keep up the good work, Deb! Deb, if I saw your name I'd pick it up no matter what, but that second cover would have me wondering "what were they thinking?" I, too, have had some funky covers. And large print? They seem to be universally bad for some reason. Not sure why because publishers HAVE to know that covers do matter. Re: Cover 2 - Dear God what WERE they thinking? As for covers in general, I heard two different authors at the same luncheon talk about having to re-write parts of their novels in order to make them agree with the cover. Is that backward or what? BTW, I LOVE my cover. I prefer cover 1 over 2. But wow, that is crazy! I can't believe they did that. Yes, definitely work with authors. Cover 1 is definately better. 2 does not say cozy at all. I agree with you, Deb. That's one scary bear. Cover #2 definitely does not give the impression of a "Cozy", it looks more like a cover for young boy's book. Fortunately the cover does not really make a difference to me, as long as I either know and like the author or if I have an intrest in the author even if not having read them yet and read the blurb about the book and find it of interest to me. There have been times when I have wondered what someone was thinking about when a cover was designed. 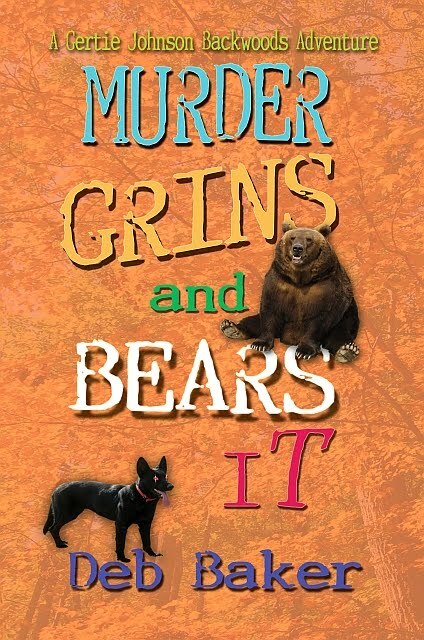 # 1 is better if only because the bear is not really scary looking and the print of the title is much better. I wouldn't buy either of them. In my mind, a cozy is something to cuddle up with on a cold night by a fire. Or, curled up in bed when the rest of the house is sleeping. There are so many ways to make a bear cute and cuddly - what the heck was going on in the life of this artist to come up with scary and nightmarish? I was warned that when your mss gets handed over it is no longer yours. I would have been very upset if they took my cuddly cozy and turned it into Hannibal Lector. As many have said, neither book shouts "BUY ME!" However, cover #1 is more appealing to me. As other comments state, #2 seems like it'd be found near the wilderness resources. I buy books based on covers and titles...a lot. I buy some because they were recommend on a blog somewhere or from a friend but I love wandering the bookstore and scanning covers. Sometimes I end up with amazing books and sometimes I don't. More often I do end up with books I enjoy (I've gotten pretty good at this). I wouldn't buy the book based on either cover. Neither says cozy to me. I think the 2007 cover was better (I looked it up... and realized that I own Murder Passes the Buck because I liked that cover). If I know the author is good, covers don't discourage me but I might pause before buying a book that looks completely out of style with other books by that author. I hate to say it but I don't like either cover!! I had no idea the author was not involved in the desision of the book covers! I would not recognise book two as a cozy.More like a YA outback adventre or even a thriller! Book one dosnt tell me a lot about the story so If I was in the library it could easily get overlooked. but at least I could tell it was a cozy!